Transportation has certainly changed over the years, and rail travel is no exception. Back in the golden age of passenger trains in the early 20th century, gourmet meals were served in opulent dining cars, filled with white linen-covered tables adorned with fine china. And although food is available on the majority of trains today, it’s simply not the same. 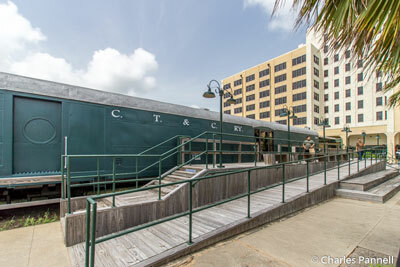 The good news is, even though the china has been replaced by snack boxes on most modern trains, you can still get a glimpse of that bygone era today at the Galveston Railroad Museum (www.galvestonrrmuseum.com). Although people think of Galveston more as a cruise port than a railway stop, it was once the headquarters of the thriving Gulf, Colorado & Santa Fe Railroad. Sadly those days are gone, but today the former depot houses a portion of the railway museum. Access throughout the museum is good, with accessible parking in front and level access over to the ticket office. From there, there’s a barrier free pathway around the Waco, Beaumont, Trinity and Sabine #1 engine — known fondly as Mary and Elizabeth Too, in honor of the museum’s founder — over to the Railway Express Building. There’s level access to the Railway Express building which contains two large model train displays, as well as a collection of vintage railroad dishes and serving plates. The model trains — O gauge and HO gage — were donated by the families of Russell Sullivan and Larry George, in their respective memories. The dining ware collection features pieces from 1868-1870, and includes place settings, glasses, silver and even old match books. A small Harvey House display is also included, and of course there are a lot of historic railroad photographs. The Union Passenger Depot, which is also part of the museum, is located behind the Railway Express Building. There’s a barrier-free pathway to the building, with level access to the station, and accessible restrooms near the entrance. Built in 1913, the depot was remodeled in 1933, and it operated until 1967. 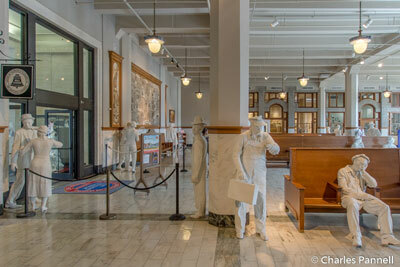 There’s plenty of room to navigate a wheelchair inside the depot, which has statues of workers and passengers that depict how things might have looked during the railroad heyday. 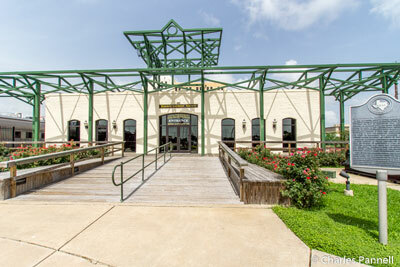 The south end of the building — which is now the conference center — was once the site of a Harvey House, while the gift shop was formerly a cigar newsstand. The gift shop has a nice collection of railroad memorabilia for sale, including vintage china and glasses. There’s also a collection of old train signals and lights at the other end of the depot, and exhibits about the railway throughout the building. 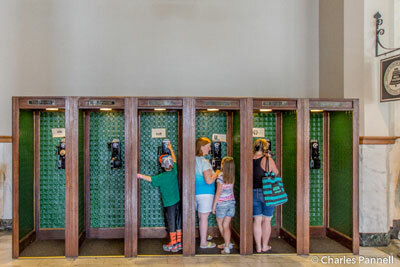 They even managed to capture the feel of yesteryear with the pay phones, the likes of which most teenagers have never seen. Suffice it to say it’s entertaining to watch teens react to this piece of old technology. The rolling stock, which is located outside, is the highlight of the museum. 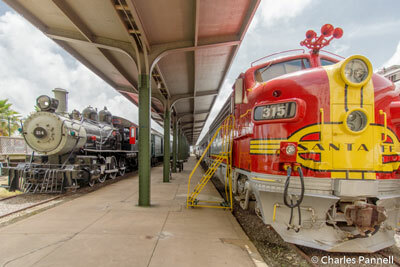 Must-sees include a 1927 Atchison, Topeka & Santa Fe all-steel caboose, a 1914 Illinois Central post office car and the beautifully restored 1953 Santa Fe Super Chief Warbonnet locomotive. The staff is extremely proud of the locomotive, which is painted in Santa Fe Super Chief colors to reflect the heritage of the Gulf, Colorado & Santa Fe Railroad. Although a few of the cars are open, the only way to board them is by climbing up the steep steps. That said, you can still get a good look at the cars from the wide level cement pathways that run the length of all five tracks. The Milwaukee Railroad baggage car, which is located on track 1, features level access from a ramped boarding platform, and includes the Faces of the Railroad exhibit. The exhibit is spread out through the four-car train and it highlights the different jobs on the railway, and includes a comprehensive timeline of the other cars in the rail yard. There’s barrier-free access through the whole exhibit, with plenty of room to navigate a wheelchair. And if you have any questions, just flag down one of the volunteers. They’re an energetic lot who truly love sharing railroad history with visitors.